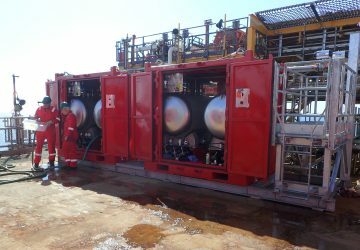 Flameskill offers a wide range of solutions in the provision of both ‘standard package’ and ‘bespoke’ foam systems, designed to provide the ultimate in fire protection to the onshore and offshore oil and gas sectors. We have solutions for Fixed Fire Monitor System for NUI Helidecks, as per CAP437 Edition 8. Please contact us for more details. Our aim is to work closely with our clients to fully understand their requirements and progress each individual project through staged schematic design and consultation phases, ensuring the brief is met in full. With a team of highly qualified technicians with many years’ accumulated experience in the oil and gas sector, our service is second to none. Working closely with major offshore operators for more than 30 years we have developed well-proven strategies for achieving cost-effective solutions in the provision of fire suppression systems. Our technicians can conduct initial feasibility studies, taking into consideration existing site specifics such as available water supply and associated pressures, risk analysis, project implications, conformity to regulatory requirements and operational impacts during installation and commissioning of new systems. A detailed appraisal of the requirement and proposed solution can then be provided for client consideration. Our experienced design team use the latest technology to provide designs for client approval prior to project progression. Hydraulic analysis and simulation allows for detailed appraisal of proposed solutions. Working closely with prestigious global offshore operators over many years has led to an accumulation of knowledge and a deep understanding of the system requirements needed to mitigate fire risk on both onshore and offshore assets, including Helideck Foam System requirements to CAP437. Whether dealing with new build or retro-fit systems, our design team can meet the brief in full, offering a logical, comprehensive service from planning, layouts, imagery, project preparation and documentation to full project management.